I'm a sucker for rimfires. From the lowly .22 BB to the hottest .22 Winchester Magnum, the rimfire serves a lot of roles: plinker, competitor, small-game getter and predator taker. The rimfire is America's darling: fun to shoot, cheap to use, and just plain efficient. But do we need another one? In the .22 genre about every conceivable option has been created from primer-only BB caps for indoor plinking to hyper-velocity squirrel thumpers. We have necked the .22 down to .20 and .17 calibers over the years and pretty much covered all the bases. Or at least I thought we had. Then I met Brad Criner, Winchester Ammunition's Rimfire Senior Product Manager. "This is not jut a hotter loaded .17 HMR," Brad said as we drove out to my local range. To prove his point he handed me both an HMR and the new .17 Win. Super Mag. Side by side it was easy to see the difference; it was like comparing a .30-06 to a .300 Winchester Magnum&apos;¦which in a way is not a bad analogy, just on a smaller scale. "We have a power fastener division of the company&apos;¦you know, they make cartridges for power nail guns and such. Well, we based this case off of the .27-caliber power fastener case. It gives us more case capacity, can handle higher pressures and ultimately more velocity. Lots more velocity." When Brad said lots more velocity, he wasn't exaggerating. Comparing apples to apples, the .17 Win. Super Mag. puts out roughly 21 percent more velocity with a 20-grain bullet than the HMR. Comparing apples to oranges, the Win. Super Mag. does something the HMR simply doesn't do — it can be loaded with 25-grain bullets, which is just what I want for bobcat, fox, and coyotes. I tested the HMR years ago when it first came out and shot a couple of big Nebraska coyotes with it. It worked, but did not shine. More bullet weight and more speed would have made a big difference. Holding the new .17, I realized the big difference had arrived. The new load from Winchester spits out the 20-grainer at 3,000 fps and a 25-grain load at 2,600 fps with energy levels right at 400 ft. lbs. and 375 ft. lbs. respectively — 150 pounds more than the 17 HMR and solid 60 foot pounds more than the hottest .22 Winchester Magnum loading! When it comes to critical factors like wind drift and drop, the Winchester Super Magnum beats the HMR by half, and when it comes to the wind-challenged .22 Win. Mag., it simply leaves it in the dust. That was the question of the day. Yes, the purpose of my trip to the range was to run some of these new loads through the chronograph, but I also wanted to see how the smoking little load would perform on paper. I should have known I wouldn't be disappointed. Like all .17s I have ever shot (from the .17 Mach II to the .17 Remington), the accuracy was stunning — even though this test day was far from perfect. It was blustery, and I was shooting two very early prototype guns from Savage, topped with Nikon Coyote Special scopes, which are ideal for hunting, but not my first choice for target testing due to their circle reticle. Like an idiot, I left my good shooting rest and rear bag in the back of my truck when I excitedly jumped into Brad's vehicle. So I had to make do with a backpack off a concrete bench as my support. After all of these excuses, guess what? I got tiny little groups! The first three shots at 100 yards made one ragged little cluster around a half-inch. Stretching the distance out to 200 yards, I was rewarded with four shots around .75 inch with a fifth flyer (that I pulled; my fault) that opened up the group to a bit over an inch. Impressive by any standards, and simply incredible for a rimfire with a lousy rest on a blustery day out of a prototype rifle. 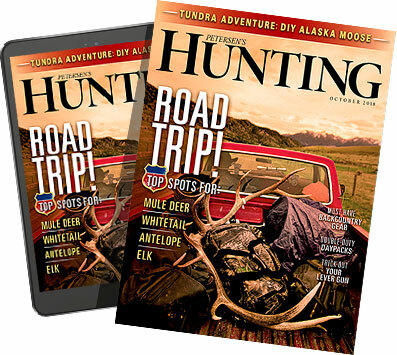 For more on our day at the range with Winchester, check out the February/March edition of Petersen's Hunting magazine.